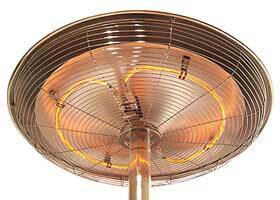 Artemis is our longest standing Carbon Fibre Patio Heater and still as beloved today as it was in the olden days. Although this model was discontinued Feb 2016 we have 1 Gold one left in stock and a few spare parts even though the 2 year warranty period from model discontinuation has expired. Please call us if you have any queries on our office number.